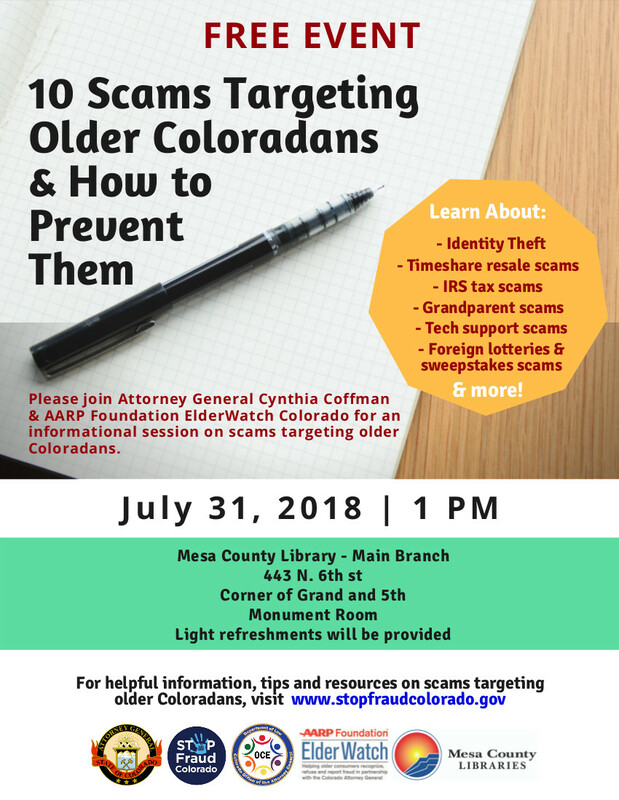 Colorado Attorney General Cynthia Coffman and a representative from a seniors’ advocacy organization will present “How to Protect Yourself from Fraud” at 1 p.m. Tuesday, July 31, at the Mesa County Libraries Central Library, 443 N. 6th St., Grand Junction. Coffman and a representative from the AARP Foundation ElderWatch Colorado will lead a class and take questions from the audience during the presentation. Participants will receive a handbook, written by the Colorado Department of Law, and will be shown how to find more information on the attorney general’s website to assist them in filing a claim or getting help if a fraudulent event has occurred. The presentation is open to the public at no charge. Adults over 50 are more likely than the general population to become victims of fraud and other forms of financial exploitation, according to the attorney general’s office. Some studies estimate that older Americans are cheated out of more than $3 billion per year. I was unable to attend this with my parent because I was working. Is there anyway the handbook and presentation could be available for review? Thank you. We’re sorry you missed the program, but glad you asked about the resources. Most of the information is on the Stop Fraud Colorado website (see below) including the 10 Common Scams Targeting Older Coloradans handbook. We also have copies of the handbook available in the main hallway brochures rack at the Central library.